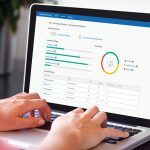 At Gartner Symposium/ITxpo, Pulte Mortgage, a captive mortgage company for one of the largest U.S. home builders, described how it used Laserfiche enterprise content management (ECM) to build an electronic loan file system that closes 12,000 loans annually. Don Blea, Vice President of Infrastructure, Information Security & Support, Pulte Mortgage, with Laserfiche CIO & Chief Corporate Strategist Thomas Phelps IV. The presentation took place on Monday, October 6, and outlined how Pulte Mortgage automated its paper-heavy origination-to-closing process to improve business performance, attract new clients and drive revenue. At Gartner Symposium/ITxpo, Don Blea describes how Pulte Mortgage used Laserfiche ECM to enable digital loan processing. In addition to loan processing, Laserfiche ECM automates a variety of processes, including accounts payable, case management, contract and vendor management, records management and more with its powerful workflow capabilities. Based in Long Beach, CA, with global headquarters in Hong Kong and offices in Shanghai, Toronto, Mexico, London, Washington, D.C., and Fort Lauderdale, FL, Laserfiche uses its Run Smarter® philosophy to create simple and elegant enterprise content management (ECM) solutions. Since 1987, more than 34,000 organizations worldwide—including federal, state and local government agencies and Fortune 1000 companies—have used Laserfiche® software to streamline document, records and business process management.